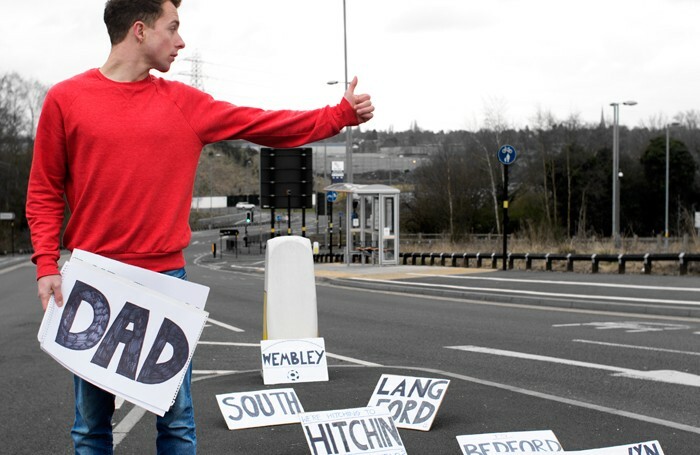 Ben Norris is on a modern pilgrimage – hitchhiking his way southward from his hometown of Nottingham, retracing in reverse the places where his father lived in his own move northwards from London. The Hitchhiker’s Guide to the Family is not only the performance poet’s first one-man show but also the winner of the 2015 IdeasTap Underbelly Award, and deservedly so. Norris hopes the road trip will help him understand why his father is loving yet distant, their relationship being one that has left them with not a lot in common. Punctuating his tale with a video backdrop of roadside footage and photos of the individuals he meets along the way, he negotiates his way via unyielding motorway junctions and service stations, is driven down faceless B-roads, and makes stopovers courtesy of Travelodge. Every driver who picks him up has a story, as do the occupants of the houses and pubs where his father’s family lived and worked, while a running commentary comes from a shared love of minor league football and his dad’s mixtapes – an evocative soundtrack that creeps up on you with its random selections of classic 70s/80s pop. As he nears his father’s birthplace in Wembley, Norris realises that he is discovering more about himself than his father, and it is a complex emotional ride. Polly Tisdall’s direction keeps the movement neatly in tune with Norris’s language, which moves in waves that reflect the mood and pace of the stages of the journey, passing from dreamy internal rhymes to choppy, funny soundbites.